Today, Bosch Connected Devices and Solutions and Bosch Mondeville announce that they are offering customized Industry 4.0 development and manufacturing solutions for the Internet of Things (IoT). A broad spectrum of highly-integrated solutions will be presented for the first time at the world’s leading electronics trade fair electronica 2018. 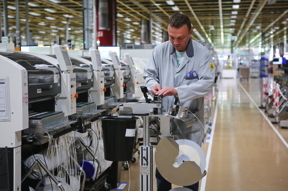 Bosch Mondeville has many years of experience in manufacturing electronics, providing best-in-class quality and full traceability. New Industry 4.0 tools and digitization of production processes enables its teams to produce highly customized series. Operating since 2014, this electronics manufacturing plant has quickly established numerous partnerships with major IoT companies in the mobility, energy and networks, industry, home and health segments. Bosch Mondeville has been named 'Factory of the Year 2017' by the magazine Usine Nouvelle and BCG for its digital transition and operational excellence. More recently, at the Manufacturing Leadership Summit, the consulting firm Frost & Sullivan awarded the Mondeville plant the title of 'Industrial Internet of Things Leader'. markets. Bosch Connected Devices and Solutions is headquartered in Reutlingen, Germany. 2016 a sales office was added in Singapore. magazine. Today, the story is continuing and is being written with the best partners. across the globe, Bosch employs some 64,500 associates in research and development.